Giving back is an integral part of the culture at TDS, which is why the company created its Be Good Citizens program. This program provides employees with 16 hours of paid time off every year to volunteer. Recently, one TDS employee took this program beyond serving her local community and used her Be Good Citizens hours to volunteer abroad. Lindsay Johnson, senior talent acquisition specialist at TDS Telecom, is an avid traveler. She’s visited 26 countries and has been to six of the seven continents (Antarctica is on her bucket list). In recent years, Lindsay has become more interested in volunteering and wanted to find a way to combine her love of travel with TDS’ Be Good Citizens program. She began searching for international volunteer opportunities and came across Global Village, an international affiliate of Habitat for Humanity. Global Village—which operates in 40 countries—offers home building projects, disaster recovery programs, major and minor home repairs, and energy efficiency projects. When Lindsay found out about Global Village, she knew it was the perfect fit. 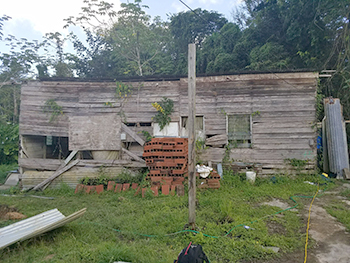 She was sent to volunteer in Trinidad and Tobago –a Caribbean nation that Habitat for Humanity has been working in since 1997. On Lindsay’s trip, a group of 12 volunteers from across the United States spent five days working on a home building project. Kathy, the homeowner, has a severe spinal injury and is unable to walk without assistance. The floor in her old home (pictured above) was full of holes, making it too unstable for Kathy to move around. As a result, she had been bed ridden for two years. 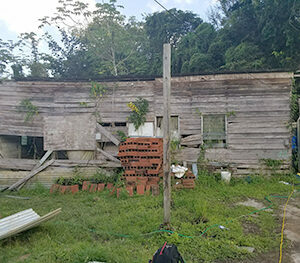 The home also had no bathroom or kitchen and the roof leaked so bad, that when it rained, Kathy needed to be covered with a tarp to stay dry. With help from Habitat for Humanity volunteers, Kathy got a brand new home with a stable floor and running water (pictured on the left). 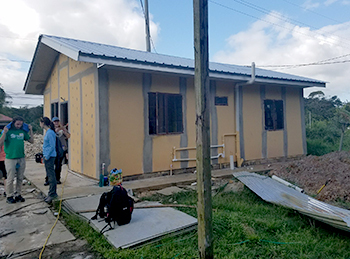 When Lindsay’s group arrived, the structural elements of the new house were already in place (done by previous volunteers), so they painted the inside and outside of the house and did some landscaping and cement work out front. Kathy’s new home was completed a few weeks after Lindsay’s group left. Volunteering with Global Village has inspired Lindsay to participate in some form of international volunteer work every year for the foreseeable future. In fact, she’s already started researching opportunities for 2019 and hopes to volunteer at an orphanage or a school.